Yesterday afternoon I was meal planning for the week and making my grocery list. 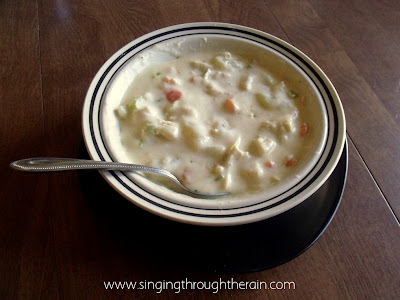 I was looking for some new recipes to make, and I happened to come across this soup on Mel’s Kitchen Cafe. As soon as I saw it and how easy it was I put it on the list to make that night. It was huge success and now probably my 2# favorite soup (my number 1# favorite is my Baked Potato Soup)! So without further ado, here is a new recipe that is sure to become a family favorite! All my veggies cut up! 2. In a large pot, melt the butter and add the onion, garlic, celery and carrots. 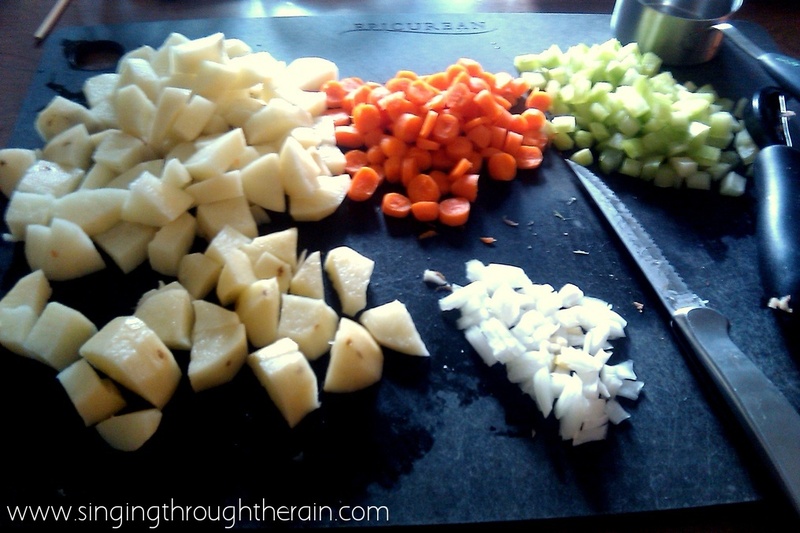 Saute, stirring often, for 3-4 minutes, until the veggies are slightly tender and the onions are translucent. 3. Add the chicken broth and potatoes. Bring the soup to a simmer and cook, partially covered, until the potatoes are tender, about 10 minutes. 4. In a liquid measuring cup, vigorously whisk the flour and milk together until smooth. Whisk the mixture into the soup, stirring quickly, and cook over medium heat for 3-4 minutes, until the soup begins to thicken slightly. Stir often to ensure the soup doesn’t burn. 5. Soften the cream cheese in the microwave until it is very soft/melty. Place the unwrapped cream cheese on a plate and microwave it (it took about 60 seconds for me). You need it really, really soft so it doesn’t leave lumps in the soup. 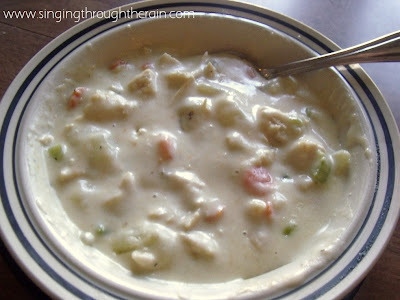 Add the cream cheese to the soup in small tablespoon-size pieces. Let the pieces sit in the soup and warm through then whisk or stir the soup until the cream cheese melts and mixes in well. This looks amazing! I will definitely be making it sometime. Thanks for the recipe! Love it! I've been looking for a soup to add to my menu – and this would be the PERFECT fit!!! Soooo yum! Planning it for next week (since this weeks menu is already made). I made this for dinner tonight, and we all loved it! Thank you!